The government’s scheme for rehabilitation of 50,000 homeless people has started from Hili frontier of Dinajpur district. 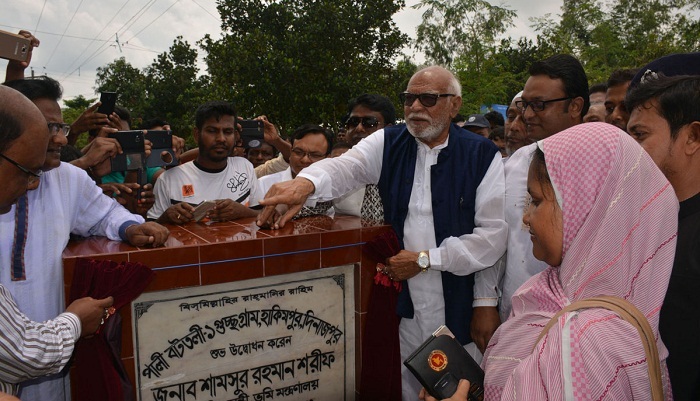 Land Minister Shamsur Rahman Sherif on Saturday inaugurated the Cluster Village (Guchhogram) - 1 in Pali Battali area of Hili in Hakimpur upazila of the district to rehabilitate 150 homeless people of 30 families, reports UNB. Speaking as chief guest at the inaugural programme, the minister said the government would rehabilitate 800 homeless people by 2016 and rehabilitate 50,000 homeless people gradually in the next three years. Asking the officials of the ministry to come out with information of khas land, the minister said there is enough khas land in the country adding that if anyone fails to give the information in due time, divisional action will be taken in this connection. Presided over by national project director of Cluster Village (Guchhogram) Project M Mahbub-ul-Alam, lawmaker from Dinajpur-6 Shibli Sadik and Guchhogram project deputy director Nurul Amin Sarker, among others, were present at the programme.